Fabulous for hard wood floors! We have polished boards throughout and some areas were starting to look a little grey and tired – I’d heard good reviews about this product so spent the extra few dollars in good faith – I wasn’t disappointed! The floors look like new and a little goes a long way! Suitably impressed! I am a domestic cleaner so I get to try lots of products. This is a really good floor cleaner and isn’t sticky to walk on afterwards. The lid as a measuring cap is brilliant and the bottle lasts for quite a while. The let down is the smell, it’s just not pleasant. If not for that I would have given it 5 stars. This is the best product for wood floors. I love the smell, the way it cleans the floor without streaks or stickiness. I only use this on my bamboo floor boards. 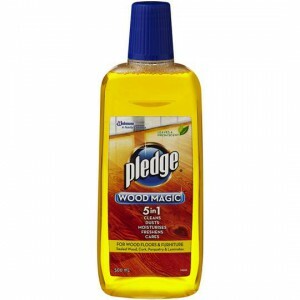 How would you rate Pledge Floor Wood Polish Magic?